Who doesn’t want to stay on trend and save money? Anyone? Yeah, that’s what we thought. We all love looking great and we certainly love a great deal so we thought we’d pass along two of our favorite trends and where to find them for less. No one can deny that florals and even fruit prints have been huge trends in 2015 and continue to be in 2016. The bigger the print, the better. And certainly, the brighter the better too! 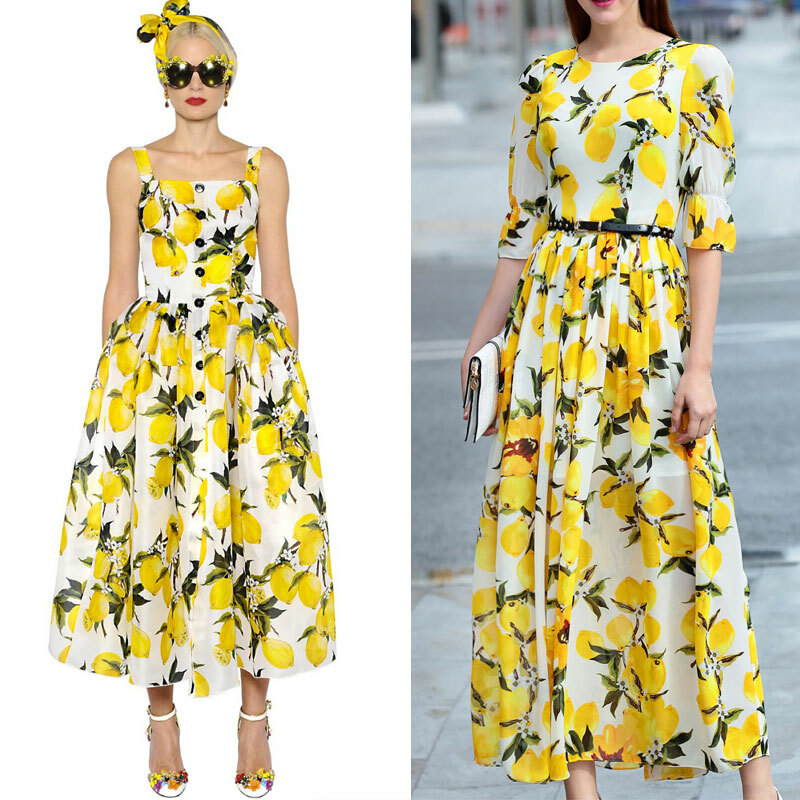 We’ve seen bright lemon patterns popping up in really high end stores so when we found this modest and affordable maxi on the right, we practically started doing cartwheels! Left dress is over $3k (hello designer prices!) and the right is on sale for less than $70 right now! We love that it combines so many 2016 trends so effortlessly! 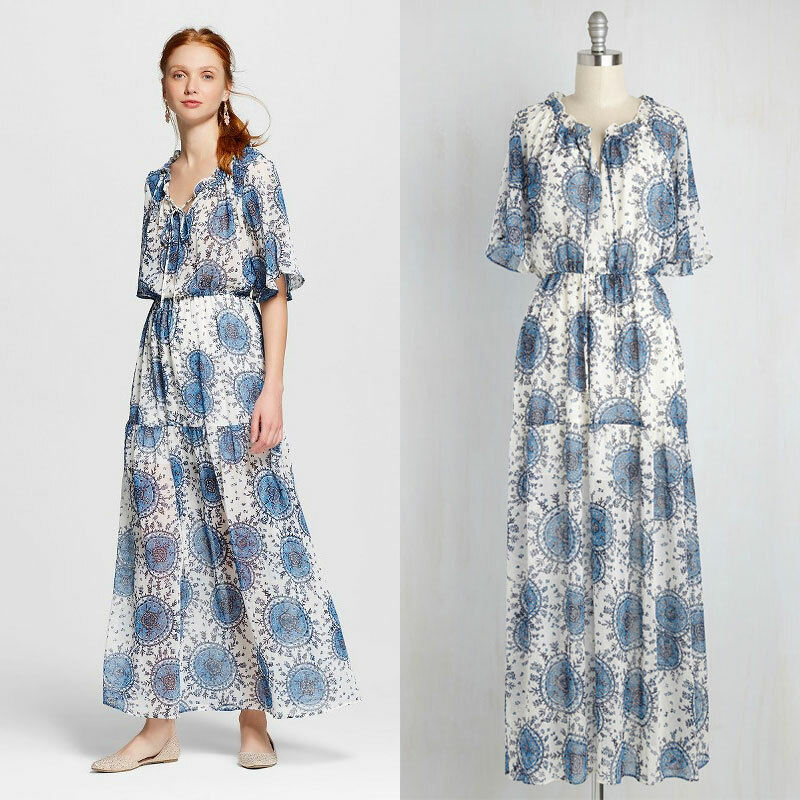 Bell sleeves, longer hemlines, and pleats give this retro print a current feel. We love it and hope we’ve made the case for you loving it too! We were kind of shocked when we saw these two dresses next to to each other. We love them both because they’re beautiful and totally on trend. The 70’s vibe is HUGE right now and these dresses are beautiful flashbacks to a time when saying “Peace” to everyone was cool. And while we’re totally vibing with this totally rad maxi, we’re stunned that these dresses are exactly the same except for price. The one of the left is under $50 and the one on the right is $85. Same print, same pattern, same cut and about 40% off. The sellout risk is high because we’re certain that we’re not the only one who’s noticed this by now so we suggest checking it out before they run out! So which one is your favorite? Do you have any other Spring trends you’d love to have featured? We’re always on the hunt for beautiful dresses at great deals and would love to hear what you ladies are looking for! Really cute dresses! I love the blue one especially…and the 70’s vibe is right up my alley!! I love big prints for this spring and summer! I’m still trying to get the 70s vibe trends though… Haha not exactly my style. Both the dresses are so gorgeous! I love how bright and happy the first one is as compared to the calmness of the second one. I seriously cant decide which one is better 😀 Hope you are having a great day! This makes me want to wear lemons! These dresses are so cute but I could never pull them off. I really like the pattern of the second one! I love the flowy maxi dress! So pretty! Love the second dress… it’s so cute and comfortable looking. What amazing dresses. Love the yellow one!